Almost two years ago, the Detroit RiverFront Conservancy released an extensive plan for Detroit’s east riverfront, including more public space, more greenways, and redevelopment of old warehouses. 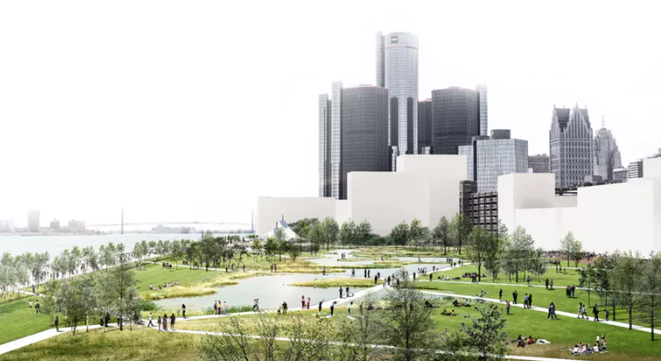 Developed by Skidmore, Owings & Merrill LLP (SOM); the Detroit Riverfront Conservancy; the City of Detroit Planning & Development Department; and the Detroit Economic Growth Corporation, the plan was a hit with the public. Now it’s gained national design recognition. The framework has received the 2019 American Institute of Architects (AIA) Honor Award for Regional and Urban Design, an award that recognizes the best in urban design, regional and city planning, and community development. It’s one of four U.S. projects to receive the award this year; the other recipients are the Pike Place MarketFront in Seattle, Shelby Farms Park in Memphis, and the Infra-Space Initiative in Boston. Since the plan was announced in 2017, bike lanes have been added to Jefferson Avenue, work has started on Atwater Beach, and an announcement (but no groundbreaking) has been made for the redevelopment of the Stone Soap Building.